Forget about President Donald Trump's signature red hat. There's now a Make America Great Again fund. But buyer beware. A Fort Worth, Texas-based money management firm named Point Bridge Capital has set up an exchange-traded fund called the Point Bridge GOP Stock Tracker (MAGA). The ticker is MAGA -- as in Make America Great Again, President Trump's campaign slogan. However, the fund isn't really a bet on stocks that could benefit thanks to Trump's policies, per se. The Make America Great Again fund is made up of companies who have workers or political action committees that have donated to all Republican candidates -- not just Trump -- over the past two election cycles. Point Bridge also is choosing its stocks from a somewhat narrow universe of companies. It screens for companies in the S&P 500. That means Twitter (TWTR), a company that is often in the news because Trump loves to use the social media platform, isn't in the ETF since it is not a S&P 500 member. But the stock is up 8% this year and clearly is one most investors would associate with Trump. U.S. Concrete (USCR), a small cap whose CEO is a supporter of Trump that I've spoken to several times in the past few months, isn't in the ETF either. Shares of U.S. Concrete are up 15% this year and 55% since the day after the presidential election -- largely due to hopes of a boost to infrastructure spending. But Caterpillar (CAT) and Deere (DE), two larger firms expected to benefit from a construction boom, are in the ETF. Who else is in the ETF? There are 150 holdings overall and no individual stock makes up more than 1% of the fund's assets. Gambling company Wynn Resorts (WYNN) is a top holding, too. That's interesting since CEO Steve Wynn is a Democrat who has competed with Trump's casinos in the past. But Wynn also criticized President Obama for too many regulations. Wynn said during a 2011 conference call that the Obama White House was "the greatest wet blanket to business, progress and job creation" in his lifetime. And Wynn said last August that he wasn't financially backing Clinton or Trump. Warren Buffett's Berkshire Hathaway (BRKA) is in the fund despite the fact that the Oracle of Omaha was a vocal supporter of Clinton. But several PACs set up by Berkshire subsidiaries donated to Republican candidates in the 2012 and 2016 elections. It's also interesting to see what other companies aren't in the MAGA ETF. None of the giants of the tech sector are in the fund either. Apple (AAPL), Google owner Alphabet (GOOGL), Microsoft (MSFT), Amazon (AMZN) and Facebook (FB) are the five most valuable companies in America. And they, along with other tech leaders, have disagreed with several Trump policies, most notably Trump's stance on immigration, his response to violence at a white supremacy rally in Charlottesville and his decision to pull out of the Paris climate agreement. If you look at the website set up for the ETF -- Investpolitically.com -- there is this disclaimer. "Stock selection is rules based meaning the personal opinions of the manager are not part of the stock selection." Point Bridge and Vident Investment Advisory, the firm that sub-advises the ETF, were not immediately available for comment. Still, there is currently no fund from Point Bridge that looks at companies who have donated to Democrats. To the victor go the spoils -- and the new ETFs? It looks that way for now. But that could soon change. 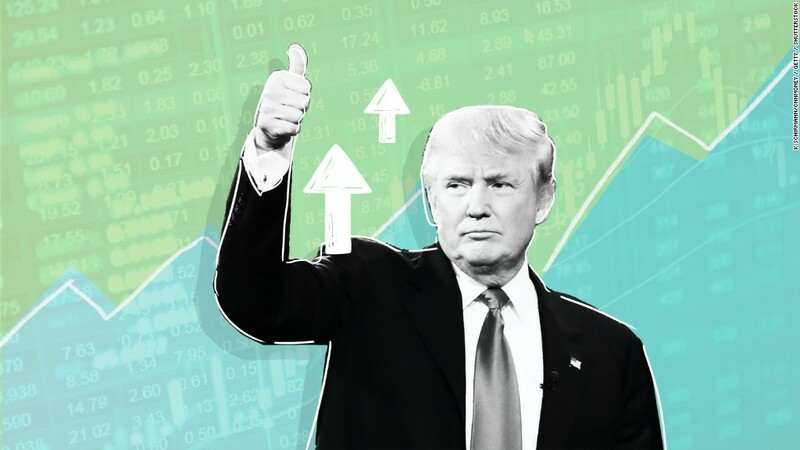 Point Bridge says that the MAGA ETF will be the first in what it dubs its Politically Responsible Investing series. I have no idea what a Democrat Stock Tracker ETF ticker could be though. It may depend on who emerges as the front runner for the 2020 presidential nomination. BERN? WARN? KMLA? GILL? Or it could just be DEMS.